I played at the Creative with Stamps Challenge blog today. The theme was hearts. Perfect for Valentine's day! I used Club Scrap Steamworks kit for my card. The background panel is made using the gear stencil. I layered brown stamp pad ink with Distress Oxide in walnut stain and a little peacock feather. I used gold embossing powder on the sentiment-which is from Club Scrap Cherry Blossoms collection. 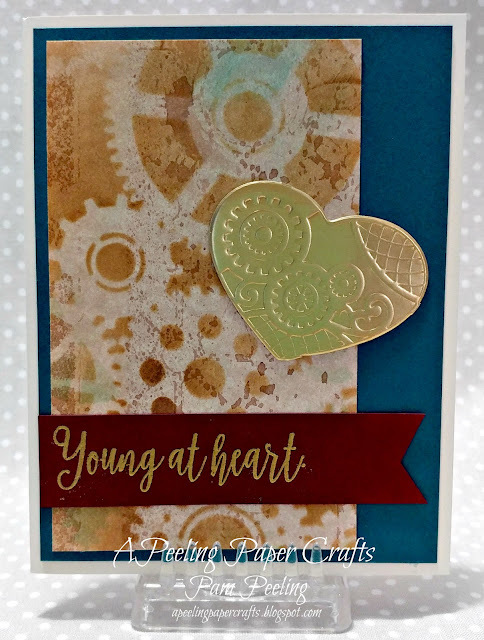 The gold geared heart die cut is from the Club Scrap Book in a Book Workshop. Head on over to Creative with Stamps and link up your own heart themed card! Great background and embossed heart! Awesome masculine card! Lovely card and even sweeter sentiment on your wonderful card. Thank you so much for joining us at Creative With Stamps-Heart Challenge this month!